For over 15 years, the Laborers’ Health and Safety Fund of North America has run its annual Sun Sense campaign to raise awareness about the dangers of skin cancer. According to the American Cancer Society and the Canadian Cancer Society nearly three million people across the U.S. and Canada are diagnosed with skin cancer each year. Along with distributing sunscreen, lip balm and neck flaps to Laborers across the United States and Canada, the Fund has also created posters, Health Alerts and other materials to make sure members know how to avoid skin cancer and detect it early. As the Fund gears up for our 2015 campaign, we’re excited to announce several new additions to the program, which is now known as Sun Sense Plus 2015. Starting this year, the program will also focus on preventing heat stress. Working long days under the hot sun, sometimes in confined spaces or wearing personal protective equipment (PPE), puts Laborers at high risk for heat stress. Heat stress occurs when high heat or exertion levels don’t let the body cool off fast enough. It leads to dehydration, muscle cramps, heat exhaustion and, in extreme cases, heat stroke. New this year, the Fund will make available cooling cloths which Laborers can use to help stay cool on the job. 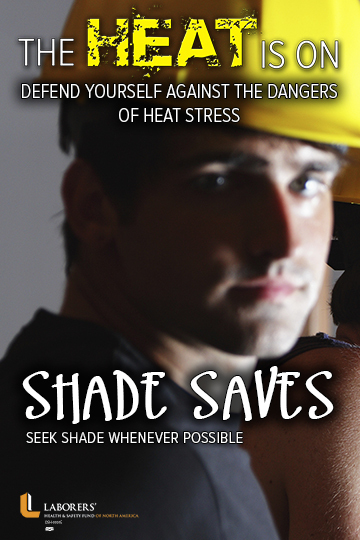 Two new posters with the slogan “The Heat Is On” aim to remind workers that water and shade can go a long way toward preventing heat stress. The Fund also created a new pamphlet, Preventing Heat Stress in Construction, that tells workers and employers about the causes and symptoms of heat stress and explains how to prevent this potentially deadly condition. Sun Sense Plus 2015 also brings several new publications aimed at encouraging Laborers to use sunscreen both on and off the job. The new publication All About Sunscreen provides guidance on what kind of sunscreen to use and gives tips on how to apply it to avoid getting sunburned. The new Health Alert Sun-Sensitive Medications explains how some medications can react negatively with the sun and offers several ways members can lower their sun exposure while on the job. If you need a friendly reminder that there is no safe tan, just watch this short video on how the sun sees you. Sun Sense Plus 2015 program products can be ordered using this year’s order form or by placing an order by phone with the Fund’s Health Promotion Division at 202-628-5465. Please keep in mind that some products are only available in limited quantities and may not be available all year. All of the Fund’s new publications on skin cancer and heat stress are available through the online Publications Catalogue at http://pubs.lhsfna.org – most of them in both English and Spanish.